« 44 Days ’til Christmas! 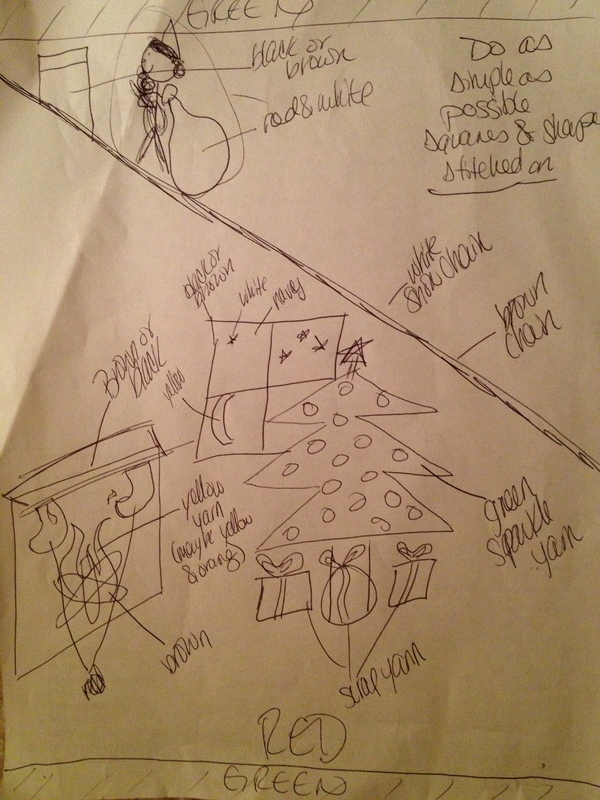 My goals for crafting presents this year are a bit lofty, but why stop there? I have planned and started a door decoration. That’s a mild way to describe it. This is no standard wreath or small decorative piece. This will cover our entire front door. Every year, my apartment complex has a door decorating contest, the prizes being money to go towards your next month’s rent. That’s a HUGE incentive. We did alright last year, but kept the concept very simple using old wrapping paper rolled up and stacked to create the tree and then placed Christmas cards we had received over the last couple of years. It was nice, but not what I had envisioned. This year will be different. Much different. After buying an unnecessary ton of Red Heart Supersaver yarn in the red and green christmas colors to make M’s stocking three years ago, I have quite a bit left over. 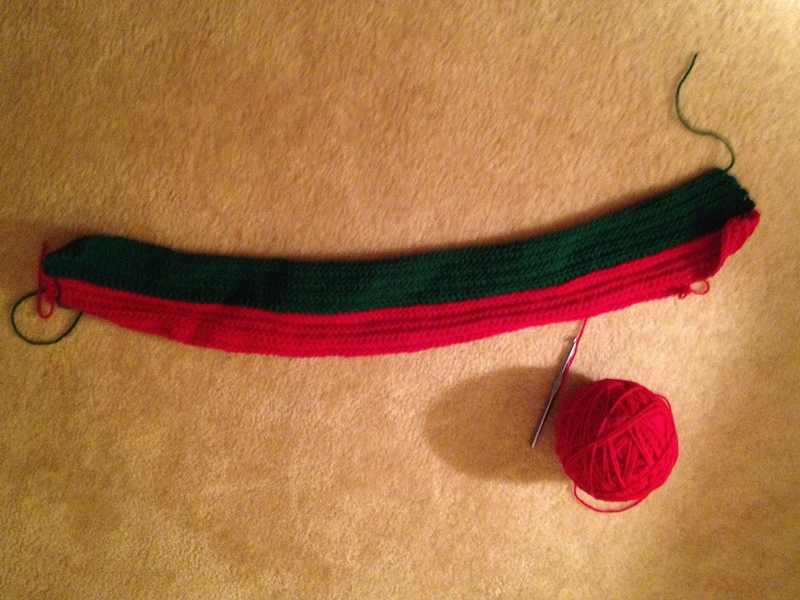 I originally planned to knit the red and green background for my door, but after recently teaching myself to do simple crochet stitches, I’ve decided it will be much faster to crochet the background. After beginning the project last night…. I have the goal to finish the background by Saturday. Though it is possible that my 3 year old can draw better than I can, I think you get the gist. 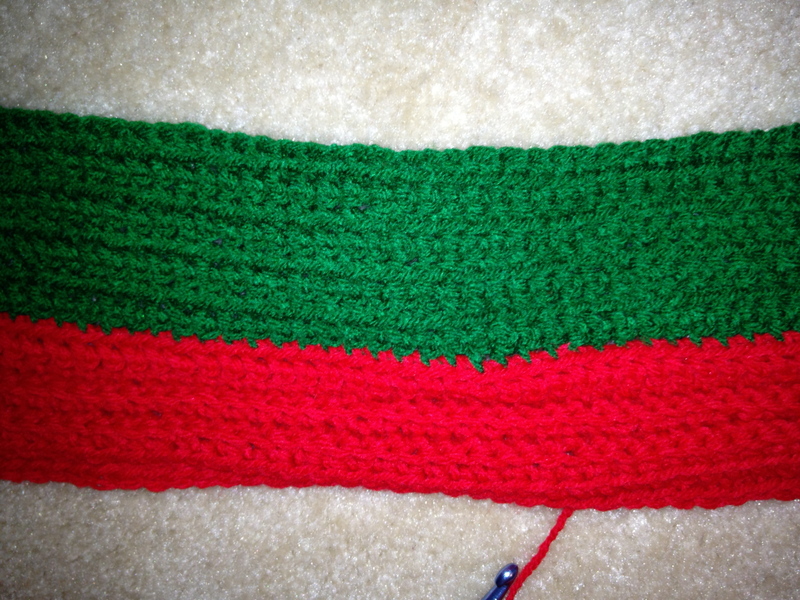 Everything will be knit or crocheted separately and stitched together. I refuse to do intarsia, so I will be making simple shapes and pieces and make every piece build on another… So not only will it be awesomely handcrafted, but it will still have a very three dimensional feel. Have I mentioned I want this done by Thanksgiving? This entry was posted on November 12, 2012, 9:28 PM and is filed under Knitting Goals. You can follow any responses to this entry through RSS 2.0. You can leave a response, or trackback from your own site.